Aintree 2019 – Starts on Thursday! Following the excitement of a thrilling and successful Cheltenham Festival the three-day Aintree meeting is starting on Thursday. At the time of writing the anticipated highlight of the week will be the proposed clash between Altior and Cyrname, who may be joined by Politologue, in the Melling Chase on Friday. Then on Saturday it’s all about Tiger Roll – are you for him or against him? I’m keen on getting some each-way value against him, but more about that next week. As usual I will have news about a horse or two that has been laid out for the meeting, subject to ground conditions being suitable. One of my best pieces of information for Cheltenham was Sire Du Berlais, who landed one of the punts of the meeting in the Pertemps Final Handicap. 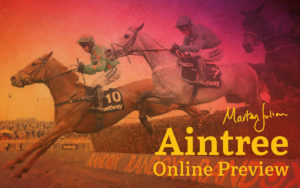 The Aintree Online Preview is published in one part, covering the Grand National, the full programme of racing on Thursday and the key races and specific horses of interest for Friday and Saturday. There may be an Update published late on Friday evening. The 2017 edition yielded a profit to level stakes from just a handful of selections with One For Arthur 14/1, Double W’s 8/1 and Traffic Fluide each-way 3rd 14/1. The 2018 edition made a profit to level stakes with Identity Thief 14/1 and successful each-way advices. By buying this service you also receive The Postscript which is a retrospective look back after the meeting. 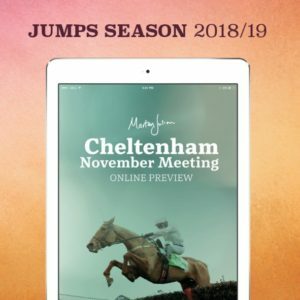 It features Marten’s and Jodie’s observations and information gleaned from each day’s racing, with pointers for the future, and it follows within two weeks of the meeting. Please note this service includes The Grand National analysis. What format is an Online Preview? Our Online Previews are published in a PDF format and can be downloaded by logging into your online account on our website. If you are unable to download services we can email it to you. If you use an iphone/ipad they open brilliantly in iBooks. To see an example of this service please click here. We cover most of the major race meetings. Apart from Cheltenham where we also write a book, we tend to publish Online Previews rather than books. We believe that Cheltenham is the only meeting that warrants us writing a book due to the volume of information. Basically it means if you buy a service about Aintree, for example, you are not just receiving news and thoughts about the racing for that meeting you are going to receive a retrospective publication with long-term information in it as well. The Record: A day packed with three Group 1 races, a Group 2 and a Group 3. Recent winners include Journey 6/1, Gordon Lord Byron 5/1, Charm Spirit 5/1, Forgotten Rules 3/1. 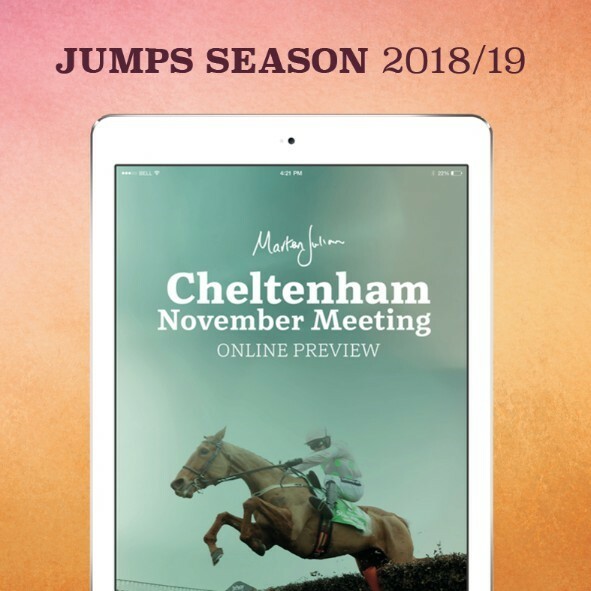 Last year was a bumper meeting, with Persuasive 8/1 (advised 28/1) and near misses with GM Hopkins 20/1, Accidental Agent and Poet’s Word 7/1 – all placed. The Record: Recent winners for this meeting include GM Hopkins 7/1, Promising Run 5/1, Lumiere 0/30, Elm Park 11/4, Pallasator 11/8 and last year Marten found Pichola Dance 14/1, newcomer Eminent 6/1, Dal Harraild 9/4 and Journey 11/8. The Record: This meeting has consistently proved highly profitable for Marten, who in 2015 found winners at 16/1, 7/2, 3/1, 11/4 and 7/4. Last year’s highlight was 22/1 St Leger winner Harbour Law and 0/30 winner Bess Of Hardwick. Please note that this edition does not cover the Thursday of the meeting. News is coming through for a couple of the support races, notably the nursery which follows the St Leger, and the Mallard Handicap on Friday. The Record (2018): Level Stake Profit with Here And Now 12/1, Pivoine 6/1 (from 8/1), Emaraaty Ana 5/1 (from 10/1) and near misses with Mab’s Cross 2nd 14/1 and Queen Jo Jo 3rd 16/1 etc. The Record: Recent editions have found winners at 16/1, 8/1 (twice), 3/1 (twice), 5/2 etc. Last year’s highlights were Barsanti 5/1, Nemoralia 15/8 and Abingdon 13/8. The Record (2016): We had a bumper weekend last year with Exosphere 17/2, Usherette 5/1, Taqdeer 15/8, Folkswood 7/4, Swiss Range 6/4 and Goodwood Mirage 3rd 20/1. Past editions gave Sky Lantern and Just The Judge, first and second in the 1,000 Guineas, and Miss France. The Record: So often a lucky meeting for us, and following winners at 25/1, 12/1, 7/1, 6/1 and 4/1 in 2013, Marten struck again with the Oaks/Derby double Taghrooda 5/1 and Australia 11/8 in 2014 and in 2015 he gave Code Red 14/1, Stravagante 7/2 and Al Bandar 3/1. Last year he gave Wings Of Eagles 40/1 as his best outsider for the Derby. The Record (2016): A profitable meeting for us over the years, with last yearâ€™s highlights the 10/1 victory of Dartmouth. Other winners were Prince Of Lir 8/1, Jennieâ€™s Jewel 6/1, Even Song 15/8, Quiet Reflection 7/4, Churchill 8/11 and a clear pointer to 16â€™1 winner My Dream Boat. The Record (2017): Subscribers to the five Online Previews for Royal Ascot enjoyed a successful meeting, with some notable near misses advised each-way. They included Headway 2nd 33/1 (beaten a head), Lancaster Bomber 2nd 12/1, Decorated Knight 2nd 10/1, Nyaleti 2nd 10/1, Santry 2nd 13/2 etc and a handful of thirds including Mirage Dancer 3rd 7/1 etc. My best outsider was Out Do, who won the Wokingham at 25/1, and Stradivarius was a good winner for us at 11/2, having been well supported from an overnight price of 12/1.